Much has been written about the class of contingent faculty. One thing that is striking is how much it has grown over time; in 1975, by contrast, only 30% of faculty were contingent. It is natural to draw a comparison between this growth and the parallel ascendancy of the managerial class within academia. Between 1975 and 2005 the ranks of administrators and non-faculty professionals nearly tripled. In doing so, they have grown four times as fast as student enrollment. There is an inevitable trade off (given finite resources) between the amount of money that can be dedicated to administration as opposed to teaching. Therefore, it is reasonable to conjecture that the increasingly powerful managerial class has led to institutional policies that support the relative growth of contingent faculty, given that contingent faculty can fulfil teaching requirements as cheaply as possible. Another issue that has received a lot of attention is how the relative growth of contingent faculty negatively impacts the quality of undergraduate education. A less explored question is what responsibilities faculty members with permanent positions have to those who hold contingent faculty positions. In my view, academia operates through a two-tier caste system where by a narrowing elite [i.e., the permanent faculty and perhaps administrators] benefits from the labor of a growing exploited underclass [i.e., of contingent faculty members]. Here, the suggestion is that permanent faculty members have responsibilities to contingent faculty members because they benefit from their exploitation—arguably in a blameworthy way. Perhaps, there is some plausibility to this view. Permanent faculty members certainly have relatively privileged lives. Furthermore, they benefit from the fact that, for instance, low-level undergraduate courses are frequently taught by contingent faculty members; consequently, permanent faculty can focus either on teaching more desirable upper-level courses or their own research. Clearly, as well, if particular permanent faculty members directly exploit contingent faculty members by taking advantage of their vulnerable position and making them do extra unpaid administrative work then they are blameworthy. However, I think that there are some clear objections to the view that all permanent faculty members are responsible for the plight of contingent faculty because they benefit from their exploitation in a blameworthy way. Most obviously, the majority of permanent faculty do not support the present system and indeed think that it is bad and exploitative. Even if there is a sense in which they benefit from the system and are relatively privileged, the position of permanent faculty members isn’t (or at least wasn’t) always secure. They fought for increasingly rare permanent positions and were (perhaps understandably) preoccupied with succeeding in the present unjust system rather than reforming it. There is also relatively little that individual academics can do in isolation. Ameliorating the exploitation of contingent faculty requires wholesale institutional reform rather than the action of isolated individuals. Indeed, there may even be a deeper collective action problem. To put the point dramatically, suppose that a sufficient proportion of permanent faculty took a firm stance: we refuse for the institutions in which we work to continue to treat contingent faculty in an exploitative way; if such treatment continues we will resign. This type of collective action may be sufficient to force through institutional change. However, if just a handful of permanent faculty did this it almost certainly would not be sufficient to affect an institutional change. The only thing that would probably change is that these handful of permanent faculty would have to resign! I am not sure what the solution to the problem is and in particular what permanent faculty members should do to try to forge a solution to the problem. At an institutional level many universities are more likely to be preoccupied with climbing academic rankings and attracting fee-paying students than with improving the lives of academics in general or adjuncts in particular. Still, at a minimum perhaps there are some things that permanent faculty members should do; after all even if they are not blameworthy for how contingent faculty members are treated in a strong sense, they may be in a good position to help contingent faculty. First, they should help expose the reality of contingent faculty—this often un-talked about underbelly of academia. In particular, few undergraduate students seem aware that many of their teachers are in perilous professional positions and poorly paid. Perhaps exposing this fact would galvanize some opposition to the present status quo. 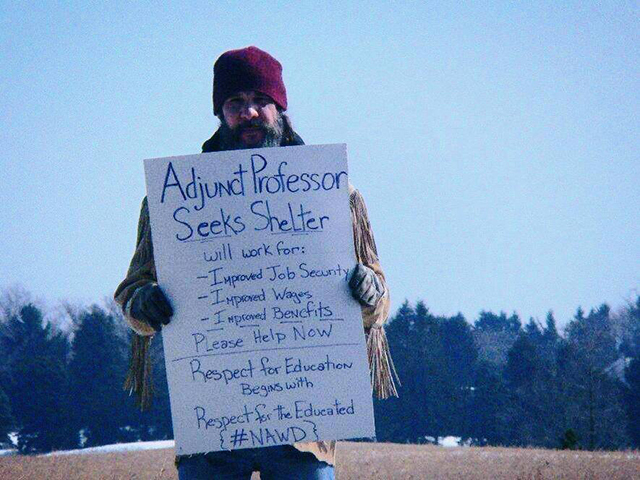 Second—and relatedly—we probably need grass-roots academic movements that represent and advocate for adjuncts. * Note that the term “part-time” is a misnomer because many of such faculty actually teach at least the equivalent of a full-time course load. Matthew Adams is currently a postdoctoral fellow at Stanford’s Center for Ethics in Society, having completed his PhD in philosophy at the University of Virginia.